A financial crisis that began when the U.S. housing bubble popped has engulfed countries large and small around the world. 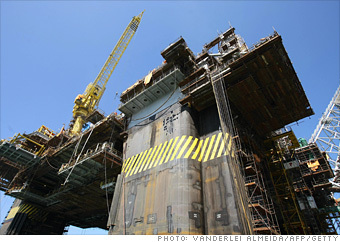 Partial view of a Petrobras off-shore oil platform in Angra dos Reis, 180 km south of Rio de Janeiro. Sinking crude prices are a tremendous blow to this oil-driven economy. The stock market is also suffering huge losses, dragged down by the country's oil giant Petrobras. Meanwhile, Brazil's real is down 35% against the dollar, since oil set a record high in July.